This quintessential fight between the heart and the mind keeps happening all the time. I am sure each on of us regularly face this dilemma, and come to a standstill where we have to select a path. And that, as iterated in the previous post, leads to confusion. Opportunity?? It’s typical in our society to feel a conflict between what we want to do (our heart) and what we feel is practical (our mind). We end up living a good part of our lives doing things that we don’t really like or enjoy. We do and say things that we think are cool, and would help us “fit in” into this artificial sphere formed by the society. We try keeping ourselves contended in our mind, and never realize that it is the heart that needs to be contented. This does cause heartaches at every point in our lives, but we just get used to it and move one. What would have happened if we had rather listened to the heart in that critical confusing moment? We might have not been this rich, this comfortable, might not be having these luxuries, might be. But then, we would have been much much more happier. And who knows, following your heart, no matter how impractical it might seem, might lead to never foreseen opportunities, and new avenues. A more content life! Is my heart at fault? Are my feelings just silly and frivolous? Or maybe it’s my mind that’s to blame. It seems like it’s always coming up with conflicting messages anyway. I remember seeing a poster in a book shop in vizag when I was young – “ choose a career in something you enjoy, and you will never ever have to work a single day in your life!”. How many of us actually be able to do it? The conformist society comes in place, and camouflages the entire thought process. The security, risk averseness, secure life, etc all these come into picture leaving the dreams on a standstill and keeping them on hold, most of the times forever. What does one do in such a dilemma? Whose side does one take in such situations – Heart or Mind? A perfect analogy to this heart mind thing would be this. Imagine yourself as this young 28 something guy, who wants to ( heart calling) get married to this good looking simple girl, and has been pursuing her leaving his flirtatious behaviour behind. Now, in this pursuit, where he starts thinking if he would actually get the simple girl ever, there is this awesomely good looking super hotel seductress( read mind) who shows herself. This simple guy is now getting attracted to the deep cleavages( read benefits in a secure manner) and is drifting towards her, forgetting that his heart still wants to be with the simple girl. The simple girl would be a better deal, but right now the seductress has much more to offer! But.. But.. The true love, the heart, still stays with the simple girl! What do you do? Simple girl? or Seductress?? very true…everyone wants to go for the seductress but not let go of the simple!! yeah… n there lies the dilemma!!! gud.. nd i selected the simple girl! 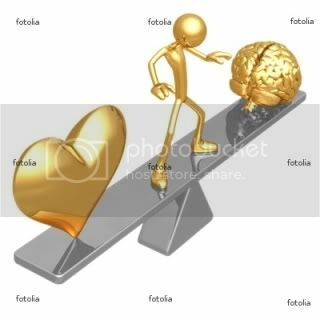 hey dude nice way .. but the difference there is ot the upper brain its about ………. i know u understand…..
No dude.. i don quite understand!